Defunct Audio Manufacturers - Aa & Ab - audiotools.com. The aim of this page is to have minimal information on some of the companies and trademarks that are now either defunct, not in operation for any reason or have exited the AV market altogether. The objective is to have information on each company similar to what appears on the links pages rather than a full history lesson, but pertinent, interesting or even just mildly unusual information may get thrown in as well. Also note that in most cases this is a company listing not a brand listing, brands listed here may have been sold or appropriated by other companies and may thus still be in use, but whenever possible links are provided to the previous and next brand owners and we are building up a Brands & trademarks index although that is not complete yet. Due to the nature of the subject matter this page is perpetually under construction. On this particular page are listed companies that have names that start with the letters Aa & Ab, for companies whose names start with the letters Ac to 9 follow the links at the top of the grey sidebar or at the bottom of each page. USA distributor of high end audio products from China, founded by USA based but Chinese born software engineer Ping Gong in around 2005. Based in Newton, Massachusetts and started out offering products from companies such as Dussun and XLH. In addition to distributed brands one of the product lines the company offered was oSound hi-fi and AV furniture and that appears to have been unique to AAA Audio, the brand’s products were Chinese made and designed, in fact made by a Chinese company that designs and makes casings and such like for the bulk of the local high end manufactures which may explain why some Chinese high end products look so similar even though they are electronically quite different. 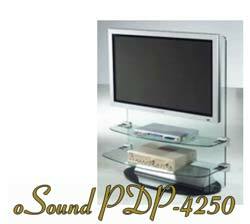 The oSound products were priced in the middle of the hi-fi furniture class pricewise, actually fairly expensive for what they offered considering their origins, a metal and glass TV and AV stand like the PDP-4250 pictured on the right retailed for USD 700 in 2005 for instance. The company dropped the brand in 2007, it is not known if that was because of lack of interest in the marketplace or if other factors were at work. The company itself hit problems in 2009 when a couple of their suppliers in China went bankrupt and later the same year AAA Audio itself was forced to close down and had been dissolved by 2011. Florida, USA based manufacturer and reseller of car audio accessories sold under the AAMP of America, Best Kits, Stinger and Peripheral brands. Bought by Recoton in Nov. 1997. Private company (i.e. registered sole trader and not an incorporated or share profit company) founded by engineer Hanspeter Gabriel in November 1994 to commercialise a high end turntable design that he had worked on since the mid 1980’s. Based in Würenlingen, in Baden, Aargau canton in Switzerland the company manufactured the AAS Gabriel turntable named after its founder until 2002 but around 2005 Hr. Gabriel sold or licensed the rights to manufacture the table to fellow Swiss high end company DaVinci Audio and he now runs a consulting company called “Gabriel Treuhand Consulting GmbH” that is active in the building sector and collects old Rovers when he has time off. Spares & service : DaVinci Audio does offer spares and support for older AAS models. Company based in Ann Arbor, Michigan, USA that was founded in March 1990 by Igor Levin and Douglas Wochna, with Levin being the majority owner and president. Originally run from Wochna’s home in Washtenaw, but moved later to a nearby business location. Manufactured signal processors, DAC's, master clocks and other professional audio products and later got into the manufacture of pro computer soundcards in a big way. Went out of business in late 2004, Levin went on to found Antelope Audio that has a very similar product portfolio to Aardvark except for the soundcards. Tiny company based in Chile, made high end audiophile power amplifiers called Elkhi to order, active in the mid 90's but has not been heard from since 1999/2000. Danish manufacturer of hi-fi and AV furniture, stands and isolation platforms etc. under its own name and high end loudspeakers under the Eben Acoustics brand. Founded in Aalborg (Ålborg) in Nordjylland in April 1998 with the main person behind the company appearing to have been Lars Christensen (Nordost) although we are not 100% sure since we have not been able to get hold of the incorporation papers. Typically their furniture products were wood veneer on MDF bases with aluminium tubing and spike contacts to the floor although they were also sold without spikes, with a variety of finishes available including a gorgeous black and grey piano lacquer finishes, the company also sold isolation cones both generic variants usable with any hi-fi and others that were sold specifically as upgrades to their stands and racks. Their loudspeakers were in some ways a more interesting proposition however, they were called the "X-Series" and were designed by British based Russell P. Kauffmann (ex-Bowers & Wilkins (B&W) salesman, later with Morel Acoustics) and were fairly run off the mill standmounters with drivers from Morel, the 2 models we know of were the X2 and the X3, both are front ported 2 way, 5 driver units that featured one soft-dome tweeter with 4 midrange drivers, with the more dearer X3 having them in a D'Appolito configuration and sporting 140mm drives while the X2 had a more conventional setup of a tweeter on top of an array and had 120mm drivers. These speakers were sold in Norway as the Adyton X2 and X3, BTW but the Adyton company has since started making speakers of their own design. The company goes out of business in 2002 and is dissolved by 2003 but Hr. Christensen has maintained ownership of the company's internet domain although that has been mostly empty now for a decade, he has also occasionally traded under the Eben Acoustics name. 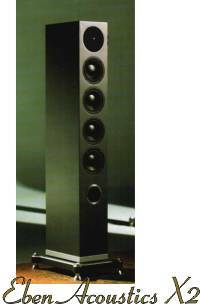 The last of the loudspeaker stocks were sold as Adyton designs in 2003. Note that the Raidho company run by Michael Børresen (Now with Dantax) appears to be a wholly separate concern and their use of the Eben trademark either been a coincidence or having been with permission from Hr. 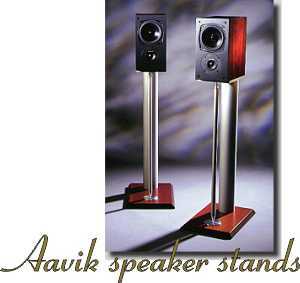 Christensen (They use cables from him), but the designs of the Raidho made Eben speakers bears no resemblance to the Aavik made ones. Spares & service : You should be able to use stock Morel drivers and driver parts as replacements, the crossovers are fairly simple and should be easily repaired using common parts, the internal wiring uses Nordost cables which are still available in similar configurations, no spares appear to be available for the stands and racks. Abbey Road Cable See --> Moving Air Ltd.
Company based in Roseville, California, USA that took over the manufacture of the products AB Systems Design had been making prior to their closure. The company continued the manufacture of the by then fairly well known and well liked sound reinforcement amplifiers the earlier company had made and added products such as equalisers and test equipment to the line-up. Timeline and background info on the company is not really known but we do know that George Anderson was the technical guru behind most of the later designs, and while sales manager Robert J. Bird owned the bulk of the company and in the early years of the company contributed some design work as well but a gent called Jeff Kuells appears to be one of the owners as well. The company disappears in 2000 and a company called Amplified Design Int. takes over the brand and continues to manufacture a amplifier designs made by ABIE, it appears that Bob Bird (note that his name is often misspelled Byrd) passed away in 1999 and that is the reason that the brand was sold. Norwegian manufacturer of high end amplifiers based in Oslo and run by Ola Abrahamsson who some of you might remember from Internet amplifier DIY discussions in the 90's. Started manufacturing amplifiers using a slightly unusual transistorised single ended topology (fully class A) in 1995 including a model called Aqua 1 that was liquid cooled, like similar valve based amps they were fairly ineffective pumping out only 10 to 30W and fairly expensive but apparently sounded rather good. The company was often listed as Abrahamsson Audio Laboratories on websites in its day and was closed down in 2000 when the owner moved to Sweden, but Hr. Abrahamsson started up another company in Sweden in early 2007 called A & O Audio that manufactures amplifiers on the same principle as the AAL ones and that company is now selling them under the Abrahamsson Audio brand. Company based in Folsom, California, USA that manufactured sound reinforcement amplifiers and related products under the "AB Systems" brand. Originally founded in 1976 by Robert J. Bird although they are not believed to have started shipping products until a little later, perhaps as late as 1978, apart from designer/engineer Mark E. Engebretson who did dome design work for them in the early 80's nothing is known about the other personnel behind the company, but nota bene both Mr. Engebretson and Mr. Bird worked for Altec. The company went out of business (probably in the late 80's) but Mr. Bird went on to found AB International Electronics that continued to manufacture the same product but now under the "AB International" brand.